This is a tour of the Joyful Wisdom Journey curriculum navigation, which is the first programming I’ve ever done in PHP. This tour explains how everything works and drops you off on the main menu pages. This will enable you to explore the areas that you are most interested in. 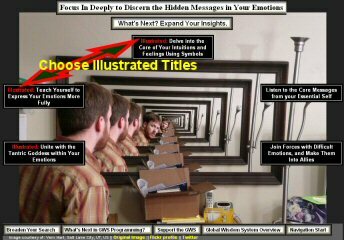 From the first or last page in the Gendlin’s Focusing exercise, click the button at the bottom left of the page to reach the “What’s Next?” page where you will be able to select the next stage of your personal growth in the completed curriculum. Note: Since creating this tour, I’ve moved the circled button to the right by one inch and one button. For the scenic tour, always select from exercises that are illustrated, as indicated by the red label besides each title. This is not necessary—just aesthetic. When you mouse over any title, a blue box appears to provide more information about when to use that particular exercise. You don’t need this information unless you are requesting that I develop it next or soon. 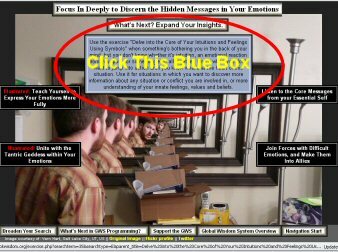 However, click the blue box to move to the next page. The next page, shown below, is similar to the cover page on the Gendlin’s Focusing exercise. It describes the exercise that will soon be available at this location. 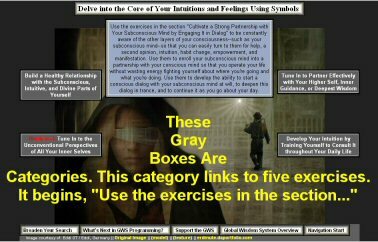 This page contains information about the exercise, including what Wisdom Skills are used to build the exercise. None of this is implemented on the Gendlin’s Focusing page. Just as on the Focusing page, click the “What’s Next?” button on the bottom left to continue exploring. All of the titles you’ve been seeing are the titles of exercises, which is indicated by the black color of the box. However, the five default choices may not be what you personally would benefit most from. At the bottom of the page, there is a button labeled “Broaden Your Search.” Click this button for more options. When you Broadened Your Search in Step 5, you reach this page of gray boxes, which are categories. There are two kinds of categories. 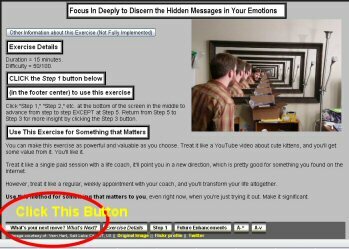 The blue box that appears when you mouse over the top category on this page begins with the words, “Use the exercises in this section.” Clicking this box takes you to a page of exercise choices. The highest level of categories are found on the Main Menu page. You can reach this page by clicking the “Navigation Start” button at the bottom right of the page, as shown above. Below is a picture of the Main Menu. 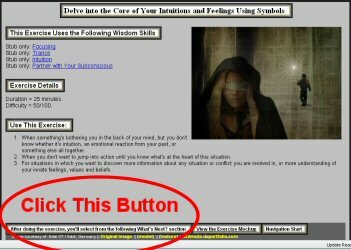 Although the main menu occupies three pages of five options each, all of which can be viewed by clicking the button at the bottom left of the screen (as shown), the most important categories are on the first page: Time management, physical healing, relationships, emotional balance, and personal freedom. What would it be like if you had powerful exercises at your fingertips at all times to accomplish the things that you need to accomplish? Since this system is integrated with the programs of the Clarity Community, you will also have other people to work with in all of these areas.